Each and every time I want to accomplish something, it seems as if I have to overcome a slew of limiting thoughts that are working against me. A few weeks ago, I was having a conversation with my brother when he challenged me to do something that was outside of my comfort zone. Instantly, I began to spew a bunch of reasons and excuses that would keep me from taking new action. My brother called me out on what I was doing and all of the sudden I was left with a realization that would forever change my thinking. 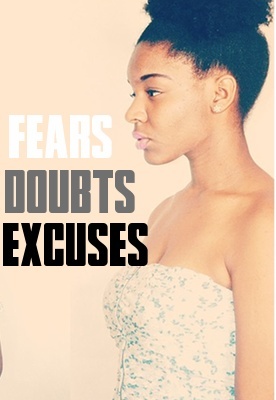 When he asked me to eliminate all my excuses, I was left with nothing to hide behind. There were no alternatives other than saying yes to the challenge at hand. Looking back on that day, I'm glad I chose to say yes because I've experienced so many benefits as a result of that decision. I only wish I could always operate in a state where I am free of reasons not to do something. This is also known as being "unreasonable." Meaning having no reason to stop us. I read a book once called "The Flinch". In it the author talks about the natural reflex reaction of that we all have. In nature, flinching is a way to protect ourselves from immediate danger. For example, we flinch and instinctively shut our eyes when an object is thrown at us or when we hear a loud sound. Make a quick, nervous movement of the face or body as an instinctive reaction to fear or pain. Flinching is meant to protect us from harm but, in modern times, we sometimes "flinch" unnecessarily at the thought of entering a new experience or stepping outside of our comfort zone. As the definition states, it's a reaction to something we fear. Every time someone challenges us to do something and we quickly come up with reasons not to do it, we're flinching. If someone looks at a price tag of something they want and immediately says "that's way too expensive!' They're flinching. It's pretty much a reflex (usually a negative one) that we do as a way of "protecting" us from new experiences. But really, this type of reaction is not protection at all. We may think it is, but really, it's the exact opposite. Then there are other times when we give excuses for our actions (or inaction). For example, someone might ask, "why didn't you go to the gym today Nadege?" Then I could say, "because I to take care of some errands that I was behind on," or "because I didn't wake up early enough," or "I just didn't have the energy this morning." The list is endless. I could come up with 100 reasons why I didn't work out today and all of them are 100% valid. But what if I chose to operate from a place of not allowing any reason or excuse to keep me from going (being un-reasonable) ? What if I said to myself, "I'm going to the gym today," and didn't allow anything else to get in my way? If only it were that easy, right? Seems like our minds are constantly delving out excuses for us not to do something. The worst part is that we actually listen. I've tried overcoming those limiting voices a multitude of times to little or no avail. Trying to overcome the voices has proved to be darn near impossible. But I'm here to say that I may have one technique. That helps me overcome the struggle. Stay present to the fact that excuses will show up and it's my job not to give them merit. When I want to do something, and I come up with reasons not to do it, I take a moment to realize that I'm flinching. Once I'm aware of what's actually happening, the value of my reasons immediately go down and I'm left with all the reasons why I should move forward in action. Another thing I do that is absolutely CRUCIAL to overcoming limiting thoughts is practicing quiet mediation on a regular basis. For the past week or so, I've recommenced a daily mediation practice. Having done this in the past, I know that consistent meditation gives me the ability to quiet the voices that are always working against me. I simply sit still every morning for anywhere from 10-45 minutes just focusing on my breathing. The experience itself feels pointless as it is darn near impossible to sit still while avoiding listening to your thoughts. I usually walk away from the experience feeling like I accomplished nothing. Then, as the days go by, I realize that I suddenly can do simple tasks without all the random thoughts popping in and out of my head. When I want to do something like workout, the excuses are gone. I operate from a place of possibility. When an idea comes into my mind, it's not accompanied by a million reasons why I shouldn't or couldn't do it. Suddenly, I'm operating with little resistance. Operating from a place of little to no resistance is optimal and should always be our intention. I think back to every goals I wanted to achieve and ask myself, "is the resistance I experience internal or external?" 99.5% of the time it's internal. There's actually nothing stopping me from getting what I want but me! Knowing this gives me even more incentive to keep practicing mindfulness meditation and seeing my excuses for what they really are. It's almost like you have been reading my mind! I wholeheartedly agree with everything you said. I "flinch" all the time. I'm always limiting my abilities & goals. I'm going to try your suggestions. This was one of my goals for the new year...challenging my thinking! Awesome post Nadege and absolutely timely! I realized that I needed to stop letting "other things" steal my ability to accomplish my dreams. There's nothing to do, but to do it! This is definitely something I am currently going through with me working out. I was happy to work out in the morning in nov/dec and now I am finding any excuse not too. I will definitely use you article to help me over come my excuses and get doing what I need to do. ..with God all things are possible. Wow, this is really good. You are really good. Thank you for always inspiring me to do better.